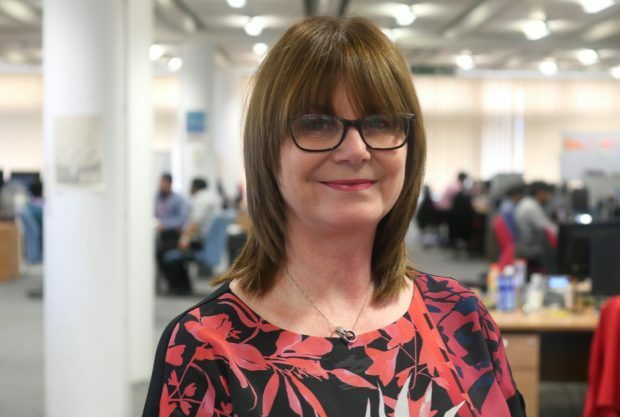 Hello, I’m Sally Hudson, a product owner in DWP Digital. I’ve been in this role for two years now and I want to share my experience of how Twitter, and blog posts in particular, have helped my continued learning. In January 2016 I attended the GDS Academy two-week Foundation course. During the course we talked about Twitter and blogging and how they could be useful tools to use as part of a digital role in DWP. Straight away, it was clear to me that I could build upon my learning by ‘following’ key people within the Department who were on Twitter or who were posting blogs, as well as people in other organisations who did the same role as me. The first step was re-visiting my long forgotten, dormant Twitter account which I had set up years earlier to follow my son during his trip to Africa. I never thought that Twitter would have a work value for me when I originally set it up, but now I was willing to give it a go. My account still had the egg avatar that Twitter starts you with! I replaced that with a photo of myself and put a little bit of information about me and my role on my profile. 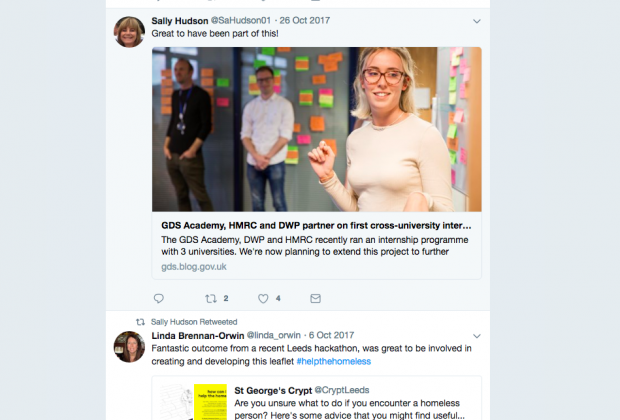 I started to follow DWP Digital, Digital leaders, other Product Owners I knew, Heads of Digital Roles, GDS and people within DWP who were using Twitter. I found it motivating to know what was going on in the Digital world, what the people I followed liked, re-tweeted and more interestingly who some of the people I followed were following themselves! Using this information I extended the list of who to follow. Each day I would spend a little bit of time looking through new tweets. Doing this introduced me to blogs, and how people were using them to share their thoughts and experiences. It was refreshing to read these blog posts and for me this became a real-time way of keeping myself up to date with new and changing approaches and better understand some of the questions and debates we were all trying to get to grips with as product owners. I’ve since used blog posts to better understand team roles, learn how teams have overcome problems as they progress through their Digital lifecycle and even to help create roadmaps with my team. There’s more detail in the GDS Service Manual now but before those updates appeared key information was captured in posts from people who’d created roadmaps for very complex questions. 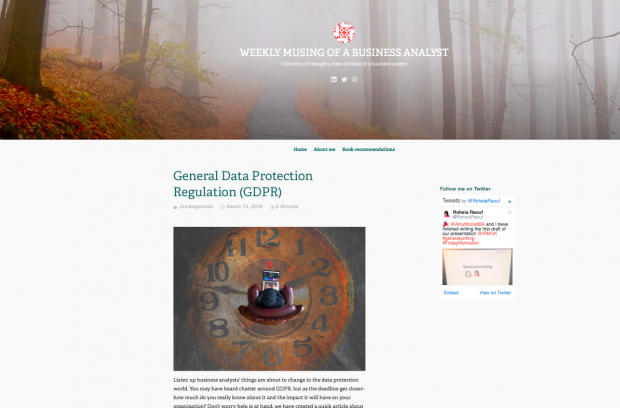 Blog posts have also been a useful way for me to better understand areas that were, initially, a bit daunting; such as how to understand what our service needs to do to meet the new General Data Protection Regulations introduced this month. I save key blogs and created a little personal library of them in my email folders for me to refer back to when needed. I also share some of these blogs with colleagues who’ve mentioned that they would like to better understand a particular area. I’ve also used Twitter to learn about conferences and events that can help my development as a product owner. When I’ve attended conferences that have a hashtag [#] you can participate more fully on the day, look at what others are thinking about that event and what pictures they are sharing. Even if I haven’t been able to attend an event you can still follow the Twitter hashtag for that event and keep up to date with important messages from keynote speakers. Traditionally there’s perhaps been a perception that you only build capability by going on formal training courses, but I believe Twitter and blogging can help you learn about virtually any topic, whether it’s work-based or not. I’m definitely not an expert, but I’ve picked up a lot of knowledge and contacts that have really helped me become more confident, and really developed my role as a product owner. I’ve even felt able to tell my story by blogging myself which just a couple of years ago is something I never thought about doing. So to anyone wanting to do the same, I’d recommend giving it a go! Great advice and motivating update Sally. Anything that helps our colleagues find and follow is always helpful. I find the cross government groups really helpful - to cut to helpful guidance too.